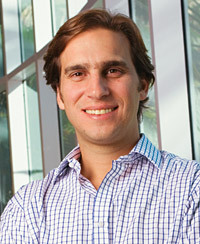 Even serious multitaskers could learn a thing or two from Alejandro Poma '05. The EMBA graduate's daily routine regularly takes him back and forth between countries, as he balances his roles at Grupo Poma, his family's 90-year-old business, with an ever-growing list of new ventures and philanthropic commitments. In his position as managing director of Grupo Poma's investments division, which commands about half of his work time, Poma manages the company's investment portfolio, seeking new global opportunities in principal and fund investing. In addition to Poma, two uncles and four cousins work at Grupo Poma, which employs 10,000 and operates in Latin America and the United States. The company has dealings in automotive, real estate, hospitality and industrial concerns. At Grupo Poma, headquartered in Poma's native country of El Salvador, he also serves as director of the automotive finance company and director of human resources and corporate culture initiatives. And, as family policy requires, Poma worked outside of the family business before joining it — both in banking and as founder of a media company called Impactos Creativos. But that's not all. Poma brings his tireless enthusiasm to a host of nonprofit ventures as well. "My ideas about leadership go beyond business, as do my interests," he says. "There are many social problems that need to be solved that require work outside the corporate world. I enjoy and am challenged by both sides of my work." Poma is head of his family foundation, which concentrates on health and education causes, primarily in El Salvador. He is also one of six commissioners appointed by El Salvador's president to oversee the country's national education strategy, and was part of the Central American Leadership Initiative's inaugural class, an Aspen Institute program designed to develop young leaders in regions around the globe. Among his involvements, Poma finds a common thread: Each requires a strong decision-making ability. "Each requires me to analyze problems and allocate resources," he says. For a multifaceted multitasker, a Kellogg School education was appealing for both its strong international reputation and emphasis on teamwork, Poma says. His experiences since graduation have left him with an even stronger respect for the Kellogg School approach to business education. "So-called 'hard' skills are all the rage, but I believe that global issues, leadership and organizational development skills are undervalued," Poma says. "Business education needs to be more balanced and practical. In the tough times, the 'soft' skills move from theory to practice, really delivering take-home value."